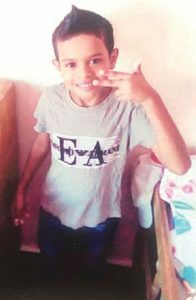 Everyone is hoping for a miracle for little Matthew Zaman who was rendered helpless after he was struck by a minibus outside his Felicity Railway Embankment, East Coast Demerara home. Kaieteur News understands that the driver of the vehicle was charged with dangerous driving and was released on $100,000 bail pending the hearing and determination of a trial. At his age when playing is a preoccupation, little Matthew, 7, is unable to walk, speak, eat or even breathe off his own after the tragic incident. He’s fed via a tube in his nose and breathes through an intrusion in his neck. He is confined to a wheelchair and his mother cares for him 24/7. In fact, he is paralyzed. After Matthew’s situation was made public, charitable organization, Saving Hands Emergency Aid (SHEA) began advocating on his behalf to raise funds to get him overseas treatment. Through the organization several specialists in the United States, Canada, the United and Kingdom and the Caribbean, including Cuba were contacted to assist Matthew’s case. But sadly, SHEA recently announced, that the doctors have all concluded that the lad sustained irreversible brain damage and will require lifelong care. He sustained significant traumatic brain injury, along with added hypoxic brain injury. According to SHEA, while there is no quick fix for the child’s condition, he will continue to receive physiotherapy from the Ptolemy Reid Rehabilitation Centre. Since undergoing physiotherapy, there have been improvements in his condition. Instead of lying in bed all day, he is now sitting up and moving parts of his body. 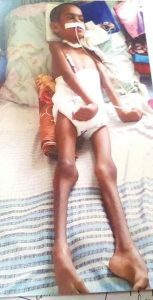 In a video seen by this publication, Matthew was sitting on a bed with assistance from someone. He was also learning to balance his head. In the meantime, his family extends sincere gratitude to everyone who helped in one way or another. Persons desirous of rendering assistance either monies or supplies can contact his mother Bibi Khan on 592-659-6766 or make deposits to Demerara Bank account #1202755.